After we have had our sacraments and we are too old to go to little people’s church, what is next? We can still continue to grow in faith and community while serving the Lord and learning more about our Catholic identity in youth group. The Youth and Young Adult Ministry is one way to fill in the gap. Here we are youth networking to stay connected to each other, to the community and to the Roman Catholic Church. 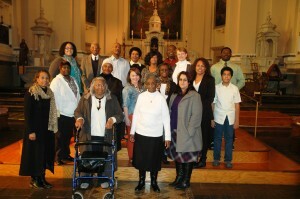 The St. Vincent DePaul Gospel Choir continues to spread the gospel of Jesus Christ through song. We sing throughout the Philadelphia area and nearby suburban communities. In addition, we sing at the Channel 6 Sunday Morning “The Mass” several times a year. The word liturgy means “work of the people.” From the people we come to prepare a suitable celebration. Our ministry is to assist the bereaved family to plan and prepare the final Mass of their loved one. Our primary purpose is to assist the family, when notified of the passing. We contact the musicians, meet with the family, and help them select the appropriate songs and select the prayers and offer any suggestions necessary. While we comfort the bereaved, we pray for the deceased. We offer not only spiritual support but also practice guidance about what steps need to be taken next. We prayerfully and lovingly prepare the Church and the Chapel for Worship. Seasonal preparations for Advent and Christmas, Lent, Easter, and Pentecost are the foundations of our work. We need both the thoughtful artists as well as the busy bee workers to keep our Worship environment alive and fresh, ready for Prayer, our committee is in formation. Please volunteer your service. Our focus is to orient people to work in an active community to provide a steady flow of help in the rectory office. Activities that are preformed by the volunteers are: answering the phone and door, making phone calls, stuffing bulletins, doing mailings, computer work, filing, and keeping the office tidy. It’s important to greet all members of the parish community. We always welcome new members to assist in our work. The Legion of Mary, a lay organization, assists the pastor to reach as many persons as possible in evangelization, visitations with all parishioners, visits with the sick and shut-in, nursing homes, newly baptized, all families, door-to-door evangelization, book barrow (handing out books, pamphlets, and other religious articles) to all during street evangelizations, Virgin Mary pilgrimage, and other assignments as given by the pastor. Meetings are on every Wednesday at the Rectory at 1:30PM. Interested in exploring the teachings and beliefs of the Catholic faith? Are you a Catholic who wants to deepen his or her knowledge of the Catholic faith? RCIA could be for you! Sessions are led by a team of practicing Catholics, with a strong emphasis on discussion, questions, and faith sharing. Participants who choose to do so may become full members of the Catholic Church. If interested, please see the pastor or call the rectory. The Pro-Life Union fosters a vision and strategy for a culture of life across Philadelphia. Our beliefs are incarnated in the family and through service to those making the choice for life. Fellowship, food, and fun! The Seniors Ministry seeks to maintain our Catholic connections so we can each enjoy, contribute, and grow in faith and love to enhance our health, our knowledge, and our spiritual and social lives. Weekly gatherings! The choir leads worship at the 9AM Mass. They practice on Tuesday evenings from 7:30 to 9PM. We are looking for all types of voices, and you don’t need to be able to read music. We sing traditional music, spirituals, and other types of songs. Existing choir members are willing and eager to help new members learn their part. The Counting Ministry is a dedicated group of trustworthy parishioners willing to help St. Vincent de Paul Parish two or three hours per month. Teams of three or four count the Sunday collections and keep the funds safe and sound for deposit. This humble and kind work without applause helps hold our parish family whole, and assists us in improving our financial ground. St Vincent’s is part of the New Sanctuary Movement in Philadelphia, an immigrant justice organization working to end injustice against immigrants, regardless of status. We seek to support immigrants in our parish and beyond and raise awareness of their plight. The Society of St. Vincent de Paul is an international voluntary organization of lay people, men and women. The vocations of its members is to follow Christ through service to those in need. Members show their commitment through person-to-person contact. No work of charity is foreign to the Society. It includes any form of help that alleviates suffering or deprivation and promotes human dignity and personal integrity in all their dimensions. The Society serves those in need regardless of creed, ethnic or social background, health, gender, or political opinion. The Website Ministry serves the parish by maintaining a vital, flexible, and up-to-date means of communication, planning, and exchange. We seek to promote God’s work within our parish to the community at large and offer an environment where members and non-members alike can connect with our worship and ministries. Writers of the Prayers of Petition (also called Prayers of the Faithful) are parishioners who write approximately twice a year, each time for a period of four or five weeks. The writers read the scriptures, pray, and consider what is happening in the Church, parish, city, nation, and world before writing. They are always open to hearing from members of the community who have particular concerns which they would like included in the Prayers of Petition at Sunday liturgy. Our mission is to get our elderly and homebound parishioners to Mass on Sunday and back home again. A volunteer driver ends up driving around one Sunday per month. We are proud that St Vincent’s is one of 40 congregations in the city-wide POWER organization, dedicated to acting on our faith so that all Philadelphia families can thrive. The Lector Ministry at St. Vincent de Paul Church is committed to serving our worshipping assembly year-round by proclaiming God’s Word in ways that take root in all who hear it. In order to do this, we strive to commit ourselves to practices that will deepen our understanding of what God is saying to us through the Word, week after week. We also continually challenge ourselves to improve our skill in conveying the Word clearly to the assembly. We welcome those who have discerned a call to be part of this ministry and who are able to accept this responsibility to talk with us about becoming a lector. We particularly welcome men and youth/young adults to join us so that our ministry will fully reflect our assembly. The nine 0’clock mass offers hospitality after mass each week. Hospitality affords us the wonderful opportunity to experience fellowship with our community. Fellowship allows us to build relationships, share with one another, serve one another, and at times comfort one another. God intends for us to experience our lives together. In order to experience fellowship in our community, we need commitment from and to each other. The goal of the Health Ministry of St. Vincent de Paul Church is to provide health information to members in an effort to improve the physical well-being of the parish. This ministry is presented by a combination of face-to-face meetings and information imparted in the Sunday bulletin as well as pamphlets distributed in the church. The St. Vincent de Paul Health Ministry also partners with other associations, such as the American heart Association, to provide up-to-date information health and wellness issues. During the petitions at each Mass, a member of the congregation (a gesture minister) walks up to the altar, standing in front of the altar. With each response to the petitions, the gesturer joins in with some body movement, usually with the raising of arms in some way. The congregation is encouraged to join in the gesture. This is a way of using body movement to enhance the petitions as we pray. It is indeed a form of liturgical dance! Visiting Eucharistic Ministers are those who bring Holy Communion to the sick and those unable to come to church, or to those in hospitals or experiencing a lengthy illness or recovery. We are a Community of Faith, powered by the Word of God and the Eucharist. Taking Communion to the sick and shut-in is a vital ministry connecting the parish to our most vulnerable members. We make every attempt to visit and pray and bring the Eucharist on a monthly basis. Visiting Eucharistic Ministers also record their visits and share any special needs the sick may have with staff. This is a way in Faith to connect with those who cannot physically make it to Church. We are all One Body in Jesus. The Bible Study Group reads scripture to strengthen faith and ground it in Biblical wisdom.